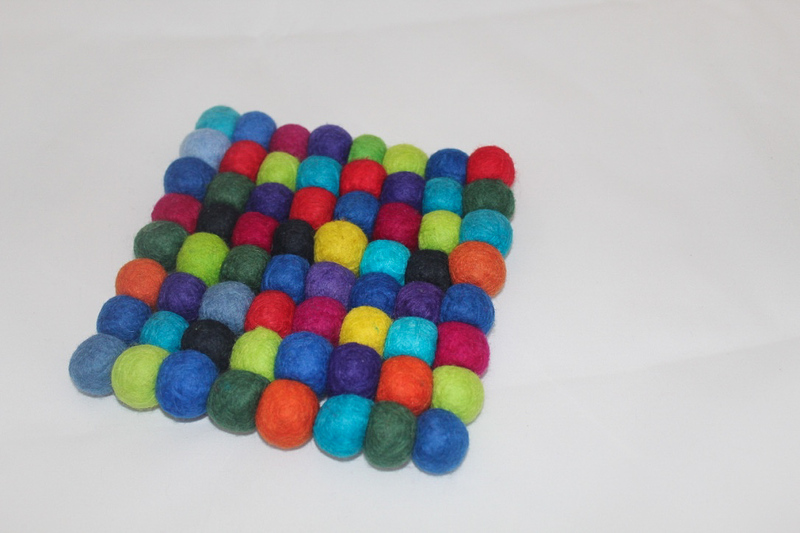 This felt ball hotpad has been skillfully crafted by the women of Artis Altai. Located in Mongolia, in the heart of the Gobi Desert, Artis Altai is an artisans’ workshop that provides employment opportunities for women who have little or no income. Artis Altai combines traditional felt-making expertise, used since the time of Genghis Khan, with innovative contemporary craft designs. Every purchase contributes directly towards improving the living conditions of women and their families whilst offering hope, confidence, and dignity through professional activity. This business is now a legal co-operative, owned and managed completely by the women themselves. This hotpad will add a beautiful burst of colour and texture to your kitchen or table, whilst protecting your kitchen surfaces from heat, cold, and condensation. Each bead has been hand-felted and hand-dyed, using natural wool and safe, quality dyes. Every hotpad is unique and multicoloured.